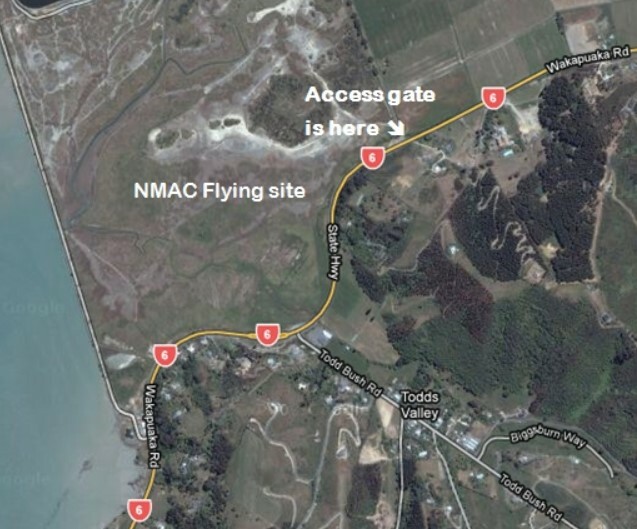 The Nelson Model Aero Club (NMAC) flying site is located on the Wakapuaka sand flats off state highway 6, approximately 9.5km north of the roundabout opposite the Nelson Trafalgar Centre (follow the Blenheim/Picton signs from Nelson). Club members meet at the flying site every Sunday and Wednesday morning weather permitting. If you are interested in radio controlled flying please feel free to visit our flying field on a club day. As the gate to the site is normally locked, visitors are encouraged to walk out to the grassed area where models are prepared for flying. Please, for your own safety, keep to the track on the right hand side (away from the runway) to get there. As well as our regular Sunday and Wednesday club days at the sand flats we also have several ‘float fly’ and ‘slope soaring’ locations around the Nelson area.